Tobias Nicklas [is]professor of exegesis and hermeneutics of the New Testament at the University of Regensburg… Nicklas is also an honorary research associate of the universities of Pretoria and Bloemfontein, both in South Africa. He previously was professor of New Testament at Radboud University of Nijmegen in the Netherlands. 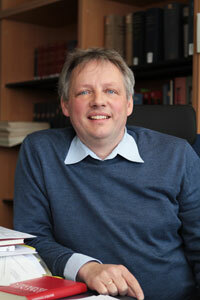 The professor is an editor and co-editor in several international projects including Novum Testamentum Patristicum (a series of commentaries on ancient interpretations of the New Testament), the Commentaries on Apocryphal Literature, and the series Wissenschaftliche Untersuchungen zum Neuen Testament. He also serves on the editorial board of the journal New Testament Studies. Nicklas has authored and edited many books, including Gospel Fragments (Oxford, 2009) and Das Petrusevangelium und die Petrusapokalypse (Berlin 2004). His book Jewish or Christian? Second-Century Perspectives on the “Parting of the Ways” (Tübingen: Mohr) will be published this summer. Together with Thomas J. Kraus, he has co-edited several books developing a new perspective on New Testament textual history. His Clark lectures will focus on subjects covered in these books.